Everyone has an opinion about which girl scout cookie is best. Some may say it is merely a matter of preference, that there can not be an actual “best” cookie, but I disagree. There is no doubt in my mind that one Girl Scout cookie reigns supreme…and that cookie is Samoas. Depending on where you live, you may know them by another name, Caramel Delites. The sweetened coconut covered in caramel with the chocolate drizzle is one of my most favorite flavor combinations of all time. They’re so good I often have no self-control around them. I’ve definitely polished off a box over the course of a few days. I’m not proud of it, but admitting you have a problem is the first step. Right? Well, this is one addiction I don’t want to cure. 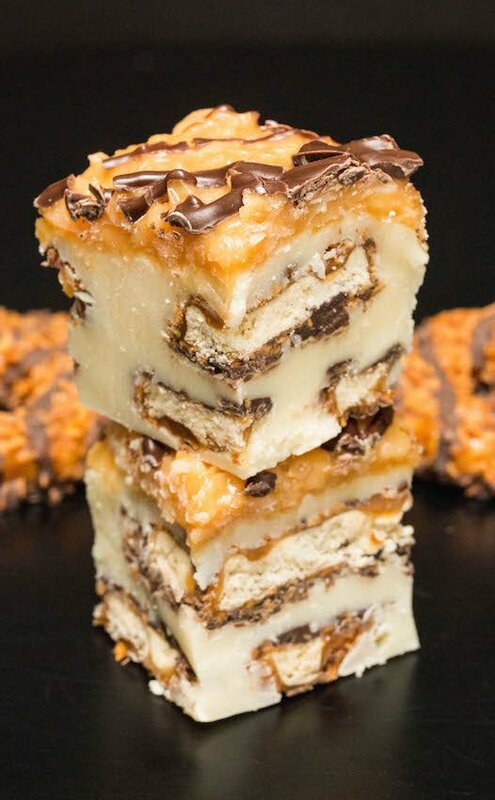 In fact, I’m going to indulge it with this over the top Samoas Girl Scout Cookie Fudge Recipe. 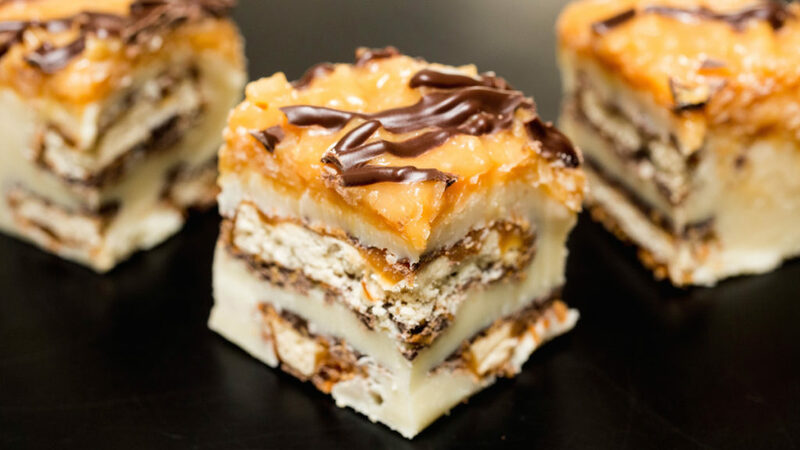 Creamy vanilla fudge is stuffed with whole Samoas cookies, then topped with a caramel coconut mixture, and drizzled with chocolate. Talk about cheat day goals! Fill a saucepan about 3/4 of the way full with water. Place a glass mixing bowl over the top to create a double boiler. Make sure the water in the saucepan is not touching it. Allow the water to come to a simmer over medium heat. Add the white chocolate chips, sweetened condensed milk, and vanilla. Stir continuously until melted and smooth. Line an 8×8 pan with parchment paper. Then place 9 of the Samoas cookies on the bottom. Pour half of the chocolate and condensed milk mixture over the top of the cookies. Gently spread with a spatula, careful not to disturb the cookies. Place the other 9 cookies in a single layer on top of the previously poured fudge. Add the other half of the white chocolate and again, gently spread with a spatula. Place in the refrigerator and chill for at least 45 minutes – until firm. Unwrap caramels and place in a microwave-safe bowl. Add 1.5 Tablespoons of water and microwave in 30-second intervals, stir in between until smooth. Add the coconut and stir until well combined. Microwave another 30 seconds, stir, then spread over the top of the fudge. Drizzle the melted chocolate over the coconut layer. Chill in the fridge 2-3 hours, until all layers are set. Cut into small squares for serving. Store leftovers in an airtight container in either the refrigerator or at room temperature. I’m drooling just looking at the pictures! Love the combination of caramel, chocolate, and coconut together. So many delicious flavours. Pinning this! I make a similar white chocolate based fudge, and I’ve added other ingredients, but never thought of layering it with girl scout cookies. I love the caramel and chocolate topping. This is amazing. Oh my gosh! These look so delicious! I love girl scout cookies so much that when I buy my obligatory boxes, I have to give them away because I will literally eat them all, not at one sitting maybe but pretty darned close. 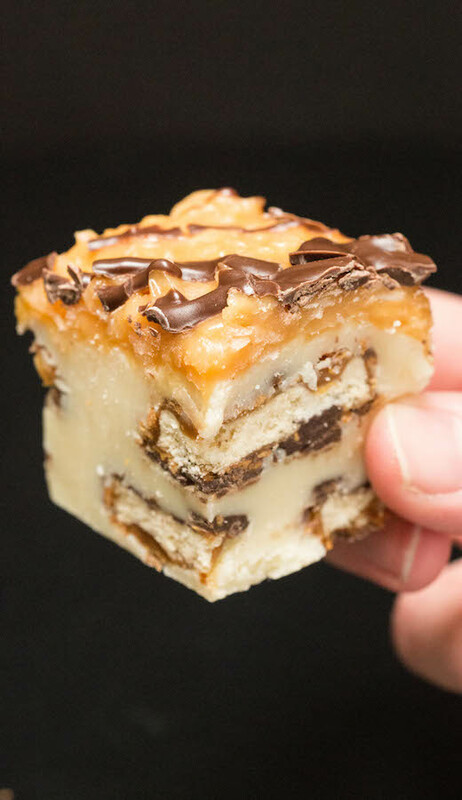 This samoas cookie fudge looks so delicious that when I make them, I’m going to have to have my hubby hide them from me so I won’t scarf them all down. Holy smokes…this is a winning combo of flavors if there ever was one! And of course, featuring one of my favorite girl scout cookies! That caramel on top! What a treat. I love fudge that has some texture and crunch to it, so this is perfect. This fudge looks so good. Such amazing flavors. The Samoa Girl Scout cookie is probably my favorite! Oh my goodness! Definitely need to make this recipe. I’ve been craving girl scout cookies, so this recipe is perfect! I’ve never had samoas cookies or this fudge but they sound just so good. I think I must have been seriously missing out until now. These look not only delicious but flavors you have used are my most favorite one’s! Caramel,coconut combo is just outstanding. What an amazing looking treat! I don’t normally purchase Girl Scout Cookies but for this dessert, some. I may just have to break down and buy some. Wow! The grandsons would chow down on these. Wow!! What a gorgeous plate of fudge!! Love that you use ingredients everyone probably has in their pantry and you bring all the classic samoa flavors together beautifully. Samoas are my FAVORITE Girl Scout cookie. I can’t resist them during cookie season and now I’m totally excited to try this recipe!